Clay holds water. It holds water deep below the surface of the track. If you can imagine a sponge that is soaked in water and then you push on its surface, the water comes out of the sponge. The same thing happens with a clay track surface. So three days of rain, and rain until late in the afternoon on the day of a race, is not a good thing. 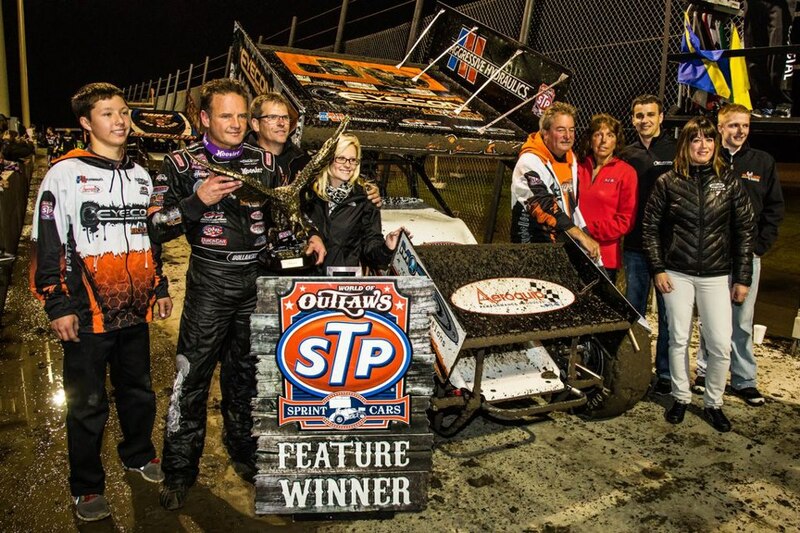 The World of Outlaws proved this last night at Salina Highbanks Speedway. The normally wide sweeping banks of Salina were narrowed to a basically one groove lightening fast track last night. A track that was too fast and too narrow to allow for much passing. Fans in attendance described the action as “follow the crowd pleaser” racing. There were more problems than just a wet sloppy track, transponders malfunctioned for whatever reason leaving the finishing order in question until the early hours of the morning. The temperatures, although in the 50’s, were deemed too cold for spectators and the event was pushed through at a weather approaching pace even though the sun had come out briefly before sunset. With only 22 cars in the field qualifying went quickly with Joey Saldana setting a new track record with a run of 11.177 seconds or 120.784 mph. The event was originally scheduled for Friday night but wet weather forced the race to run a day later, the cool temperatures equaled big horsepower as all but one of the competitors qualified under the previous track record of 12.874 seconds that had been held by Craig “The Crowd Pleaser” Dollansky. The heat races showed minimal passing with the most positions gained being a single spot. Heat race winners were Sammy Swindell, Steve Kinser and Craig Dollansky. The Dash held more of the same type racing with Dollansky showing the way over Outlaws points leader Daryn Pittman. The A Main was hampered by the groove and a half track and was evidenced by the hard charger of the race Cody Darrah, picking up only four positions. The A would be won for the second time by Craig Dollansky. Dollansky fought off Paul McMahan’s relentless effort through heavy traffic in the 30-lap A-main to remain perfect in Outlaw competition at Salina, where he also won in 2011. Points leader Daryn Pittman was third with Sammy Swindell and Joey Saldana rounding out the top five. McMahan was trying to seize the lead in his CJB Motorsports machine, but while he could get up to Dollansky he was unable to carry enough momentum to surge past him. Still, it was a remarkable performance after the team was forced to change motors early in the night, putting them behind from the start. Dollansky who was in traffic by Lap 3 never missed a mark and held the lead from the drop of the green. 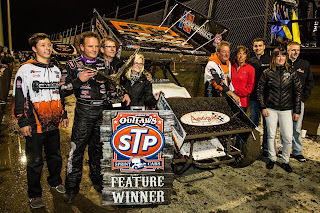 Outlaws points leader Daryn Pittman, who is from Oklahoma, started alongside Dollansky on the front row and tried to hold back McMahan while chasing down Dollansky, but wound up settling for third in the Kasey Kahne Racing Great Clips car. In the heat of the summer, a clay surface is a God send to dirt racing. In the spring not so much, just as its ability to hold water is a blessing in the heat and dry of summer, it is equally a curse in the spring and fall when the heavy rains of spring bring life to the earth. It’s an understood thing that Mother Nature is not a race fan. She never has been and likely never will be. But the Outlaws went toe to toe with the elegant lady and this time they broke even and move on to the historic high banks of the Grand Dame of Dirt, Eldora Speedway.